We have come to the end of a beautiful project. Sophie’s Universe is all done. It was a wonderful journey in which I met a lovely designer named Dedri Uys from “Look at what I made”. She was so generous to me by giving me the opportunity to make videos of her beautiful design. I also want to thank all of you for all your lovely and encouraging comments you left on my blog and my you-tube channel about my videos. There are several Yarn Packs available that includes everything you need. These have been assembled by Dedri and the colorway for each pack is on her blog. There are also yarn extension packs that allow you to make the squares Jack and Lydia so that you can extend your blanket. This is what I have also done with my Sophie. These are an addition to the original packs. In my color chart you can find which yarn choices I made, or rather did not make. There was no predetermined color planning. I literally took it one row at a time looking at what was available in my yarn stash. I have made a serious hole in my stash which means I can buy new yarn! I will post soon to show you what I have bought. Many of you though my initial name for my Sophie was not doing her justice. Hence I have given her the new name ‘Rainbow’ because she has all the colors of the rainbow in her. Just because I can’t help it. 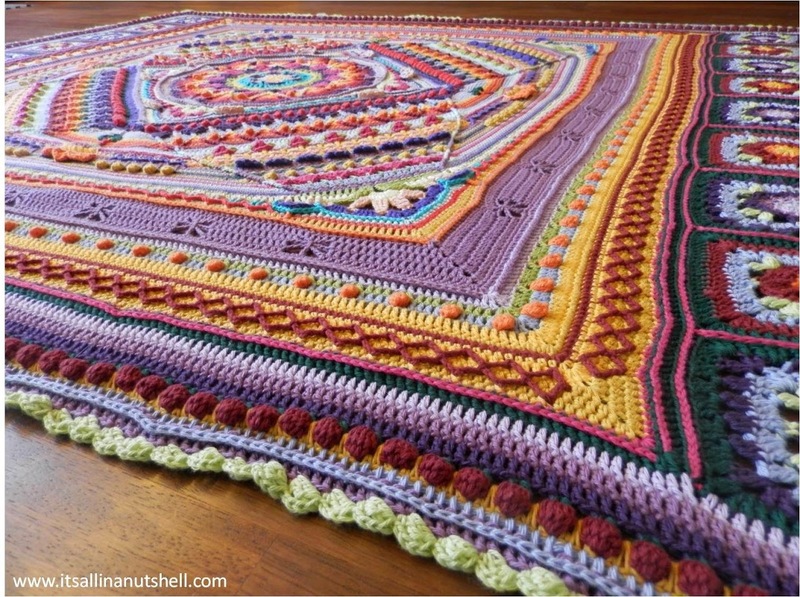 here, for the last time, some nostalgic moments of the making off Sophie’s Universe Rainbow.. If you want to look back on all the previous posts for Sophie’s Universe, here they are all listed. Part 1, Part 2, Part 3, Part 4, Part 5, Part 6, Part 7, Part 8, Part 10 & 11, Part 12, Part 13, Part 14, Part 15, Part 16, Part 17, Part 18, Part 19, Part 20. This gorgeous project has come to an end, but fear not, the next project including videos is already in the making. Esther, I cannot thank you enough for all the work you did on this project! I am from South Africa, and would like to thank you for your wonderful tutorial on Sophie’s Universe. I loved every moment of making this blanket and is going to give it to my Daughter on her 21st Birthday. Esther, thanks so much for your videos. Without them, I would never have been able to finish my Sophie. This was a great and fun project. One day I will make one again. I can not thank you enough for the video. It is so helpful and I would not have got the instructions as easily. Sophie is my first really advanced project and I am really enjoying it. Thank you again. I can not express my gratitude enough for these videos , I would not of been able to do my Sophie without them – awesome!!!!!!!!!!!! This is so beautiful. You have such an amazing eye for color. I would like to do your color scheme for Sophie. Do you have a suggested quantity list for the colors you used?? I did not keep track of yarn amounts at all. I made this from stash and left over yarn. I used 2 to 3 balls of all colors, i remember that.